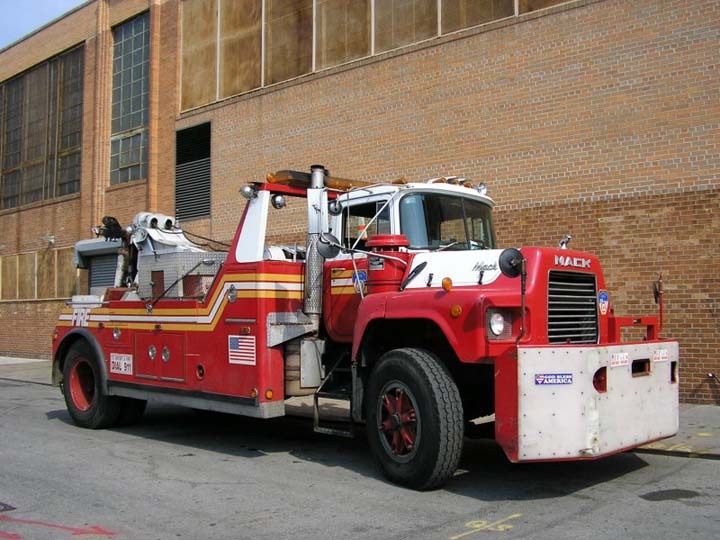 This New York FD, USA Mack heavy wrecker is used by FDNY to tow wrecked&damaged FDNY apparatus. Also used in heavy rescue like towing trucks involved in RTA. I think this vehicle is actually gone from the FDNY roster, replaced by the 2002 Mack RD/Weldbuilt. BTW anyone has a photo of the IHC wrecker the FDNY used back in the 60s?? Added by David on 12 November 2008.
was purchased that year was a Mack MR/Weldbuilt. that was located at the old Training Centre on Randel's Island(truck 433)?. Added by Pete Matten on 12 November 2008. Pete, thanks for the correction. I've seen a photo of the new (2002) rig in the fleet maintenance section of the "FDNYtrucks" site, so I thought that it was most probably meant to replace the one pictured here. As to your question -I've been interested in the FDNY ever since I can remember and especially in the older rigs. I just knew that they've been using the IHC wrecker back then but I haven't seen any photo of it so far, so it was just natural for me to ask if somebody could share it. Added by David on 22 November 2008. David, picture on its way of the 1960's Int/Harvester Wrecker of the F.D.N.Y. Due to copyright on the picture, I can't send into this site though.OK, Pete. Added by Pete Matten on 23 November 2008. This wrecker was used by FDNY until hurricane Sandy 2012. Added by Pete on 23 January 2014.